Tailings are the waste by-product of the milling of ore. They consist of finely ground ore mixed with water and may also contain chemicals used to process the ore, such as cyanide. 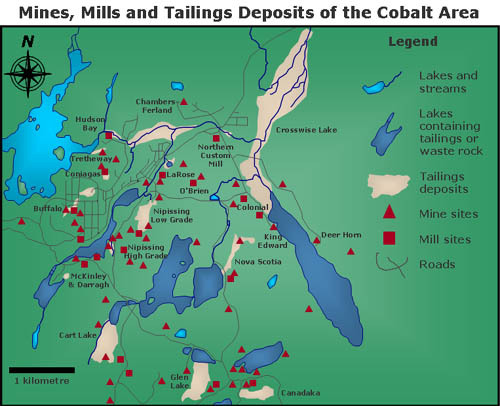 There are a large number of tailings deposits areas in the Cobalt area, and tailings were deposited on land and in lakes. Some of the tailings deposits in the Cobalt area are briefly described below. Several studies have been done to look at the concentrations of contaminants in tailings in the Cobalt area. All of these studies have concluded that the tailings in the Cobalt area contain high amounts of arsenic, as well as nickel and cobalt. Some of the tailings also contain mercury and other metals as well. The concentrations of these contaminants vary between tailings deposits, but arsenic in particular is found in all of the tailings in the Cobalt area. Tailings are not the only materials in the Cobalt area that contain arsenic and other contaminants. Waste rock from the mines can also contain contaminants. In addition, some of the soils in the area are contaminated, and even the concrete from the foundations of some of the old mills in the area contains contaminants, especially arsenic and mercury. More information on contaminants in tailings in the Cobalt area, and releases of contaminants from tailings can be found in �Environmental Studies in Cobalt�. Some efforts have been made to reclaim some of the tailings in the Cobalt area, but many of these tailings continue to be a source of water pollution, contributing to the high levels of arsenic and other contaminants in the lakes and streams around Cobalt. Work that has been done to reclaim the tailings is further discussed in �Reclamation Efforts�. The Buffalo Mine was located within the town of Cobalt. A low grade concentrator operated on this site from 1907 to 1923, and a cyanide plant operated from 1912 to 1916, 1920 to 1921 and for 3 years in the 1950's. Tailings were deposited in a valley just northeast of the site. After the mill shut down the tailings were covered. After a major fire in Cobalt in 1977 the area was used for temporary housing in mobile homes, many of which are still present. The Coniagas Mine was on the west side of Cobalt Lake, on the north edge of town. The mill operated from 1907 until 1924. Tailings were deposited east of the mill, where they can still be seen, just behind the town arena. Starting in 1915 tailings were also deposited south of the mill in a depression now occupied by the Cobalt Public School. Some tailings were also deposited in Sasaginaga Creek. The Trethewey Mine was northwest of the Coniagas, near Sasaginaga Lake. A mill operated on the site from 1910 to 1920, and tailings were deposited in a valley with a dam to prevent the tailings from entering Sasaginaga Lake, though some did enter the lake. Other dams were built to prevent the tailings from draining into Sasaginaga Creek. One of these dams has failed and some tailings have migrated into the creek. At the mouth of the valley there is now a 2 m high ridge of tailings, while the rest of the valley is lined with a thin layer of tailings. The Hudson Bay Mine was north of the Trethewey Mine, near the north branch of Sasaginaga Creek. A mill operated from 1910 to 1920, and all of the tailings were dumped into Sasaginaga Creek. Tailings migrated eastward along the stream valley to the Chambers-Ferland property. The Chambers-Ferland property was east of the Hudson Bay Mine, near the confluence of Sasaginaga Creek and Mill Creek. Ore was not milled on site, but tailings migrated to the site from the Coniagas, Trethewey and Hudson Bay mines, as well as from Cobalt Lake and Mill Creek. The site is now one of the largest accumulations of tailings in the area, with an estimated 200,000 tons of tailings. The Nipissing Mine and Mill complex was one of the largest and longest operating sites in Cobalt. The complex was located on the hill on the east side of Cobalt Lake, opposite the town, known as Nip Hill. The first mill built by Nipissing was completed in 1907 on the southeast shore of the lake, and it operated until 1912. In 1911 the Nipissing high grade mill was built, using mercury amalgamation. A small amount of tailings were deposited in a depression down the hill from the mill, close to Cobalt Lake. Tailings were contained by a concrete wall, but there is a culvert in the wall and most of the tailings have been washed down to the lake. The Nipissing high grade mill ceased milling in 1918, though the refinery on site continued to operate, producing silver bullion. Remaining tailings contain some of the highest concentrations of arsenic and other contaminants of any tailings in the area. In 1912 the Nipissing low grade mill was built further north on the hill. This mill operated until 1932, using cyanide. Tailings were deposited below the mill at the base of Nip Hill. Three dams were built to contain the tailings, but all have failed, and it is estimated that about half the original volume have migrated into Mill Creek. The remaining tailings were revegetated in the late 1990s. The LaRose mine was located north of Cobalt Lake, beside Mill Creek. A mill was operated from 1952 until 1956 and again from 1958 until 1971. There is a small tailings deposit north of the complex, beside Mill Creek. The Nova Scotia Mine was located on the east shore of Peterson Lake. A cyanide mill operated from 1910 until 1922. From 1910 to 1918, tailings were deposited in the lake, and from 1918 to 1922 they were deposited in a small valley adjacent to the site. Failure of the dam resulted in considerable erosion of these tailings into the lake. However, in recent years the dam has been rebuilt, preventing further erosion of tailings into the lake. The Beaver and Temiskaming mines are about 5 km south east of Cobalt. The Temiskaming mill operated from 1910 until 1921. Tailings were deposited west of the mine, in an area draining into Giroux Lake. Beginning in 1951, tailings were removed for reprocessing and only a thin layer of tailings remains. The Beaver Mine is just north of the Temiskaming Mine, and a mill was built in 1912, operating until 1920. Tailings were deposited in a creek east of the mill, and many of the tailings have migrated along the creek and have been redeposited in Kirk Lake and further downstream at the south end of Crosswise Lake. The Green-Meehan property is in Bucke Township, near Highway 567. A mill operated from 1925 to 1928 and tailings were deposited in a shallow depression on the north side of the highway. The tailings are now vegetated, but the area has also been used for many years as a garbage dump, and much of the tailings are covered by refuse. The Canadaka Mill operated at the north end of Giroux Lake from 1977 until 1980 and again in 1983 and 1984. Almost 350,000 tons of tailings were deposited in a containment area in a valley at the northeast end of the lake. This area consisted of several containment dams and a settling pond. In 1985 the run-off from the tailings into the lake was of acceptable quality. Several mills deposited their tailings in Cobalt Lake: the Cobalt Lake Mill, Cobalt Reduction Company, McKinley-Darragh Concentrator, McKinley-Darragh tailings mill, the Hellens Mill and the Agnico tailings mill. In 1914, the lake was drained, and tailings were removed for reprocessing. New tailings were returned to the lake. Operations continued until 1920 and again from 1922 to 1932, when a cave-in occurred in a mine under the lake, allowing tailings to flood into the workings. In 1951 the Hellens Mill was built on the site of the Cobalt Lake Mill to reprocess tailings. The lake was again drained, and operations continued until 1955. Initially, the new tailings were deposited in the north end of the lake, but because of their high cyanide content, it was decided to deposit them in Cart Lake instead. In 1966, Agnico Mines drained the dry for the third time and reprocessed tailings until 1969, with the new tailings being deposited in the north end of the lake. Some of these tailings now form the foundation of the Cobalt Lion's Club Park, which divides the lake. During the cleanup following a major fire in 1977, mine waste rock from around the town and rubble from buildings destroyed in the fire were dumped in the lake to increase the size of the park from one baseball diamond to two. It is estimated that well in excess of 300,000 tons of tailings remain in the lake. Cart Lake is a small lake southeast of Cobalt. It has been used for tailings disposal since 1910, and is now almost completely filled with tailings. Early operations on the lake were quite small and the lake remained quite clean and was used for fishing and duck hunting until after World War II. In 1954 and 1955 an unknown quantity of cyanide rich tailings from the Hellens Mill on Cobalt Lake were deposited in the lake. From the early 1960's until 1983 a flotation mill operated on the south shore of the lake. About 1.2 million tons of tailings were dumped in the lake, almost completely filling the lake, and burying all tailings previously deposited in the lake. No significant attempts were made to limit the migration of the tailings, and as a result, the tailings have migrated north into a wetland area between Cart Lake and Peterson Lake. These tailings were revegetated in the late 1990s. The Nova Scotia Mill deposited tailings in Peterson Lake between 1910 and 1918. In addition, migration of tailings into the lake from the land disposal site adjacent to the lake has occurred. From 1920 to 1922 tailings from the lake were removed and reprocessed. In 1968 and 1969, the eastern lobe of the lake was drained and tailings were removed for reprocessing. New tailings were deposited in Crosswise Lake. Crosswise Lake is the largest lake in the area, and hosts the largest accumulation of tailings. Tailings were deposited in the north end of the lake by at least five different mills. This tailings deposit is very large, although estimated tonnage is not known. Crosswise Lake is significantly shorter than it used to be. A dam was built across Farr Creek to limit the migration of tailings along the creek, but this dam failed in the 1970s and has not been rebuilt. North of this dam the tailings are vegetated and the area is a wetland. At the north end of this wetland, which is the northern limit of tailings migration, there is a small water level control dam. Glen Lake is about 1 km east of Cart Lake. The first mill on Glen Lake was the Cobalt Central Mill, which opened from 1907 until 1910, and again from 1912 until 1919. Tailings from the mill were deposited in the lake. A second mill, the Foster Mill, later named the Penn Mill, operated from 1957 until 1986 when it burned down. A new mill was built on site and is currently used by SMC Canada as a custom mill, recovering metals from recycled materials. Tailings are being deposited in the lake. From 1962 until 1975 the Bailey Mill operated, depositing about 300,000 tons of tailings in the lake. Like Cart Lake, Glen Lake is now almost completely filled with tailings, and in places the tailings reach an estimated thickness of 15 to 20 m.